We Found 5 Must Have Gifts for Whiskey Lovers! There’s a lot of talk out there when it comes to the wine lovers and the beer lovers, but what about those who prefer something a little stronger to drink? That’s right- where are all the whiskey lovers? Most of you probably have at least one friend or family member who would rather order an Old Fashioned than a margarita when going out for the evening. True whiskey lovers enjoy everything about the experience of drinking whiskey. From having the right glass, to crafting the right drink, to the actual type of whiskey they like to drink, and everything in between. If you know someone who is a true whiskey lover, you need to listen up. We have found the coolest gifts that any true whiskey drinker would absolutely love. If you are in need of a gift idea (or even if not- save this for later when you do!) check out this list. 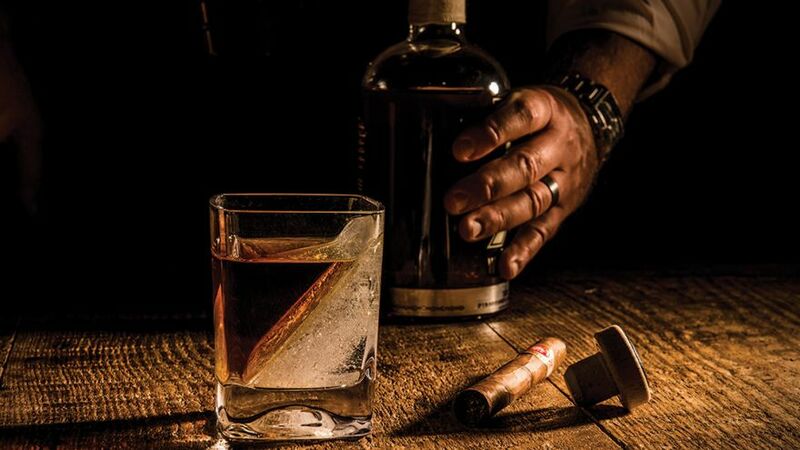 These are the 5 things that we think every whiskey lover must have. If there is one thing that any true whiskey drinker can’t stand, it is a watered down drink. Especially as you start to drink nicer whiskey, you do not want that bold taste to slip away. Turns out, you can perfectly chill your drink without watering it down, and even better, you can do it in total style also! This genius invention from Corkcicle is one of the coolest things we’ve seen in a while. This gift comes complete with the proper old fashioned square glass and a silicone mold that will form the perfect ice wedge that you can add to your drink. Add the cube, then pour the whiskey on top! This ice wedge will keep the whiskey cold without watering it down- allowing you to sip the drink slowly without fear of the taste deteriorating. Any true whiskey lover needs a solid decanter for their best whiskey, don’t you think? This globe decanter in particular is such a unique way to store and display whiskey, we just love it! The decanter also comes with two unique glasses that are etched with maps to match the look of the decanter. This is a great decor item in addition to being very practical. If you happen to know a whiskey lover who also loves to travel, this truly is a must have gift for them. Regardless, this is a unique piece that anyone would appreciate. 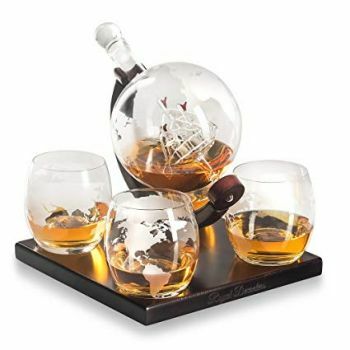 We love the attention to detail on this set and think it is a perfect gift- most people wouldn’t just go out and buy a globe decanter for themselves, but they would love to receive it as a gift! A decanter is a popular gift to get for whiskey lovers, but this is not just your ordinary decanter. This also makes a great gift item if you are shopping for say a married couple who both enjoys whiskey- they’ll have a decanter and each have a glass to use! Perfect! Of course, if you are a whiskey lover you are sure to appreciate a hand crafted cocktail from time to time. Who says you have to go out to have a nice cocktail? Enjoy a fun evening in with the help of this book – Whiskey Cocktails! 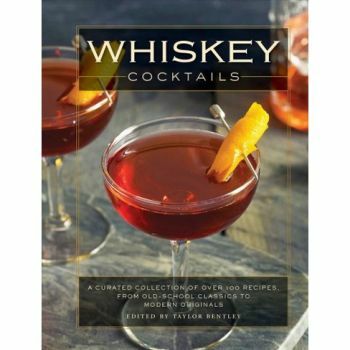 This is the absolute must have book for whiskey lovers, as the entire book is filled with cocktails featuring whiskey- the Old Fashioned, Mint Julep, Blue Blazer, and so much more! In addition to having all a whiskey lover’s favorite drinks, the book itself is incredibly eye catching and features gorgeous visuals throughout. As much a work of art as a practical cook book, we love this book. Created by master mixologist Brian Van Flandern, you can be sure that the recipes here are the absolute best and will result in cocktails that even the pickiest drinkers will totally enjoy. This next gift is incredibly cool – and we had never heard of it before! Whiskey drinkers often have a love for a true barrel aged whiskey. Being barrel aged gives the whiskey a unique, bold taste – but it doesn’t always come cheap! 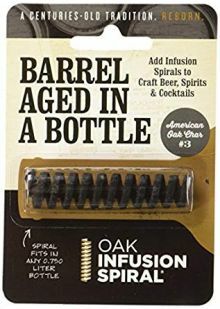 This oak infusion spiral can be added to just about any whiskey bottle in order to add in that barrel aged taste! This is perfect for any whiskey lover that maybe can’t quite afford the top level whiskey they love the most (and we don’t blame them- it can be seriously expensive!) This is such a genius idea to easily transform ordinary whiskey into one that tastes aged to perfection. And best of all, you only need about 2 weeks (or less) to get the full barrel aged effect! Finally, enjoying a nice cigar often times goes hand in hand with enjoying a nice glass of whiskey. Are you shopping for a whiskey lover who enjoys both? This is the perfect glass for them! This classic square whiskey glass comes with a cigar rest built right in! Totally genius and a must have for anyone who enjoys both together. Now, you can easily hold your drink and your cigar in one hand with ease! Use your other hand to eat, play cards, or whatever you want! We love a genius idea, and this is just that. 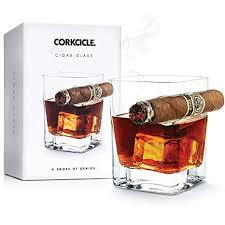 This is definitely a must have for any whiskey drinker who also enjoys a nice cigar. So there you have it! These 5 must have gifts cover pretty much the entire whiskey drinking experience. All that’s left to get is the actual whiskey! From cool glasses, to the right ice wedge to keep the drink chilled, to storing the whiskey, perfecting the taste, and of course crafting the perfect cocktail, these are gifts that any true whiskey lover will go crazy for. Which item on this list do you think your whiskey loving friend can’t live without? Have it on hand for their next birthday and you are sure to be their new favorite person! Cheers!